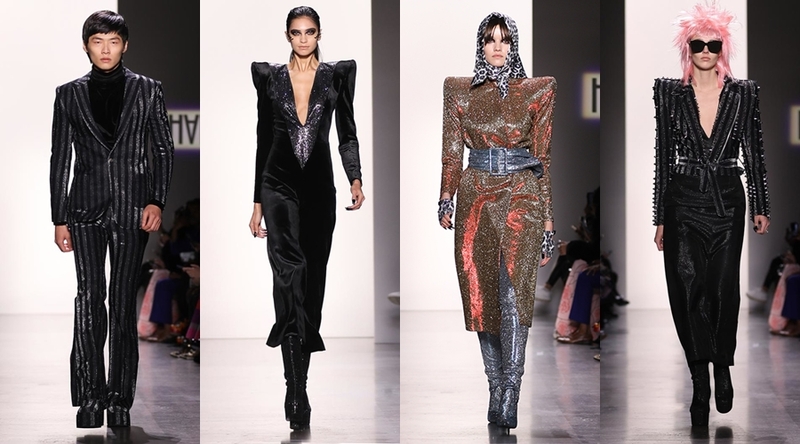 On February 10th, the Hakan Akkaya Fall 2019 collection debuted at New York Fashion Week with all its glitz and “Glam Rock”. Each look did not disappoint with undeniable hinted elements that could only remind you of style icons such as David Bowie and rock bands as KISS. The Istanbul designer re-created the Glam rock style of the 80s, enveloped in a rich tapestry of metallics, black and white colors and edgy silhouettes. Scroll to see the collection. The metallic and luster proliferated on the runway, one flowing look after another. Black, white & metallic Silver, with a small dash of metallic pinks thrown in as an accent, made up every look of the collection in the designer’s full range of women and men clothing. The various looks in black with silver studs & spikes for women were striking. As did the range of inventive, body-con dresses, some with incredible sleeve and super strong shoulder details glittered down the runway. A range of black & white, bold-striped faux furs for both men & women were impeccable statements. As the finale walk-around commenced, the entire audience shrieked their approval. Only to ramp it up even more when designer himself, Hakan Akkaya, walked the entire runway, nearly floating with pride as he blew kisses to his legions of fans, new & old alike. Fall 2019 is sure to dazzle. What did you think of the collection and which were your favorite looks?